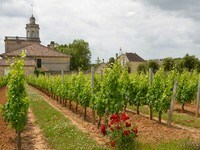 Château Bonnet and its vineyards are situated in the commune of Grézillac ten miles south of St. Emilion in the Bordeaux sub-region of Entre-Deux-Mers. It produces red and rosé wines from a combination of the classic red Bordeaux grape varieties Merlot, Cabernet Franc and Cabernet Sauvignon as well as a dry white wine from Sauvignon Blanc, Sémillon and Muscadelle grapes. The current owner is André Lurton, one of the most celebrated wine personalities in the whole of Bordeaux who also co-owns the Châteaux Dauzac in Margaux and La Louvriére in the Graves district. He has also been largely credited with the establishment of Pessac-Léognan as an Appellation d'Origine Contrôlée. 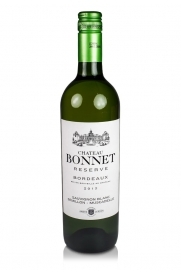 Château Bonnet has a long history the vineyards having been planted by the Reynier family who were successful merchants in nearby Libourne and who replaced an area of pine forest with vine covered slopes during a thirty year period in the 16th. century. 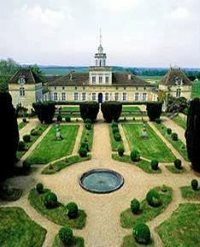 The château itself was built in the following century replacing the old manor house. When André Lurton inherited the estate from his grandfather in 1953 it comprised one hundred and twenty hectares of which thirty were under vine and after an original re-planting of the vineyard and building a new winery this area has since been expanded to almost three hundred hectares under the appellations AOC Bordeaux Rouge, AOC Entre-Deux-Mers Blanc and AOC Bordeaux Rosé under his stewardship. All of the wines are well respected by critics and connoisseurs alike for being examples of exceptionally good value for money in their respective appellations. The large wine producing area of Entre-Deux-Mers, so called because of its position between the tidal rivers Garonne and Dordogne, has a natural diversity of terroirs although in general terms the soils are a porous mixture of clays and limestone sitting atop a limestone plateau and in the north, where Bonnet is situated, the soils are very similar to those of St. Emilion. This whole sub-region between the rivers is criss-crossed by valleys and slopes dividing the plateau areas. While the AOC Entre-Deux-Mers appellation is restricted to dry white wines the area of AOC Bordeaux Rouge, under which appellation the Ch. Bonnet red wine is sold, is far bigger and actually encompasses all land that is legally allowed to produce classified wine and not designated as a higher appellation. In short what is neither forest nor wetland. Possessing such favourable soils within a much more mixed general area it is little surprise that the red wines produced by Ch. Bonnet out-perform their somewhat modest classification. Ch. Bonnet Red - a supple, fruity, smoky wine with soft tannins made from a blend of 50% Merlot and 50% Cabernet Sauvignon, it is un-oaked and keeps for 4 to 5 years. Suitable to drink with a wide variety of meats and vegetable dishes and light enough to have been known as a "lunchtime claret" a few years ago. 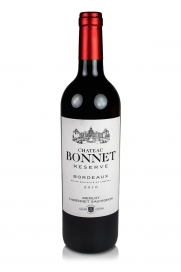 Château Bonnet Réserve Red - more powerful and concentrated than the basic red. It is made from the same blend of grapes i.e. 50% each of Merlot and Cabernet Sauvignon. Forest fruits predominate with vanilla notes from the oak and fine tannins. Keeping up 6 to 10 years depending on the vintage. Food as above. Divinus de Château Bonnet Red - Château Bonnet's prestige cuvée. Selected extra-ripe grapes are vinified for this wine, the wine is a blend of 80% Merlot and 20% Cabernet Sauvignon which produces a wine that is more powerful and rich with riper black fruits, leather, spice, and vanilla from the oak ageing. This wine is very suitable to drink with duck, game birds and mature hard cheeses. It keeps for 10 years or even longer depending on the vintage and storage conditions. Ch. Bonnet AOC Entre-Deux-Mers Blanc - un-oaked white wine for everyday drinking with vibrant fruit, a blend of 55% Sauvignon Blanc, 35% Sémillon and 10% Muscadelle. Aromas of pear, tropical fruit, gooseberries, citrus and floral notes with a suggestion of peach on the palate. Perfect with e.g. gravadlax or other fish. A fresh wine at its best in the first year after release. Screw-cap closure. Château Bonnet AOC Bordeaux Rosé - this pale pink wine is a blend of 50% Merlot and 50 % Cabernet Sauvignon. 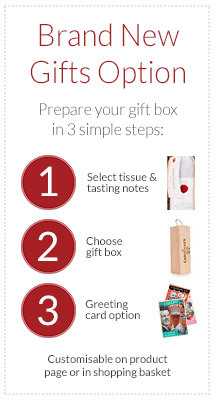 A fresh, fruity wine with notes of redcurrant and raspberry. Recommended for a wide range of food types from grilled fish to couscous with curried lamb or vegetables. Drink young. Screw-cap closure.